One-in-five school age (K-12) youth in Iowa is of color, and 4-H membership should mirror this trend. Thus, in 2014, Iowa State University Extension and Outreach 4-H Youth Development began to move from the concept of inclusion of diverse youth to belonging. 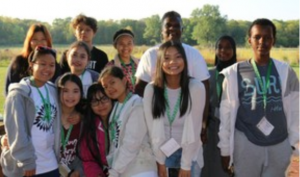 Iowa 4-H has created four Culturally-based Youth Leadership Accelerators (CYLAs) that mobilize cultural strengths and culturally based narratives to introduce and strengthen the relationship between youth and 4-H. The CYLAs also connect underrepresented youth, whose families may be unfamiliar with post-secondary education, to the college experience. Each CYLA includes a day at the Iowa State University campus, an overnight experience, and a day of culturally-based workshops with embedded 4-H program priorities: Healthy Living, STEM, Citizenship and Leadership, and Communication and the Arts. Much of the curriculum is entrenched in ethnic or cultural literature and research. In only two years, CYLAs have brought more than 500 young leaders of color into Iowa 4-H. In some cases, the youth have joined existing 4-H clubs and learning communities. Many more have worked with volunteers to develop new culturally-based clubs. CYLA graduates also have helped lead statewide programming. Contact Info: John-Paul Chaisson-Cárdenas, State 4-H Youth Development Program Leader, Iowa State University Extension and Outreach, 515-294-6772, jcardena@iastate.edu. Photo credit: John-Paul Chaisson-Cárdenas.